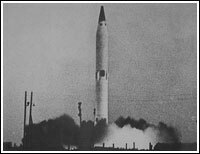 The R-14, became the third Soviet medium-range ballistic missile, which used storable propellant, enabling Soviet missile troops keeping it fueled and ready to fire for extended periods of time. The R-14 extended range and accuracy of its predecessors -- the R-11 and R-12 -- which both also used storable propellants. The rocket was developed at OKB-586 in Dnepropetrovsk, in present-day Ukraine, under direction of Chief Designer Mikhail Yangel. The R-14 was under testing in Kapustin Yar from June 1960 to February 1961 and it was officially adopted in armaments on April 24, 1961. In 1962, the first R-14 missiles, aimed at the Western Europe were deployed in the Soviet republics of Latvia and Ukraine. On Sept. 5 and 8, 1962, a pair of R-14 missiles with live thermonuclear warheads were fired from the Baikal region to the Novaya Zemlya nuclear test site during the Tyulpan nuclear exercise. In 1962, as a result of the Soviet decision to deploy missiles on the Island of Cuba, the R-14, along with the R-12 missile, became a source of nuclear standoff between the USSR and the US, known as the Cuban missile crisis. Unlike the R-12, which had been deployed on the island, the R-14 missiles were en-route to Cuba by the time the confrontation was resolved at the very brink of a nuclear war. The R-14 missile became a base for a two-stage space launcher, known as Kosmos-3.